Origin labels, more specifically Geographical Indications (GIs), allow organised producers to define quality standards and defend their food products’ reputation while highlighting their geographical origin and value to consumers. Café de Colombia was the first non-European food product registered as Protected Geographical Indication (PGI) under EU legislation (510/2006, followed by 1151/2012). This paper aims to identify the dynamics of collective efforts and the rules of the game developed by coffee growers to protect the collective intellectual property right. Our guiding research questions are: i) to what extent can the Ostrom’s design principles explain effective collective action for GI registration and implementation? and ii) can collective action for GIs re-shape relations between supply chain actors and support producers in gaining control over origin products? We collected data using semi-structured interviews and document analysis, which we then processed in a qualitative text analysis. Results show that the principles are very helpful for understanding the internal collective action of coffee growers and also clearly show the challenges in the interaction with industrial coffee processors (e.g. international roasters, brand owners). A pure focus on the producers’ collective action for establishing and managing the origin protection does not give a full picture, since green coffee beans are roasted and commercialised abroad. The GI has already re-shaped the relationships along the supply chains, as international roasters sign the producers’ rules governing the PGI use. The commercial GI impact however, will depend on consumers’ willingness to appreciate and pay extra for high quality origin coffee as well as the readiness of international roasters or brand owners to emphasise on origin coffee, in addition to their brands of blended coffee. Extreme poverty in many rural areas of developing countries is not a new story. The immense political, climatic, technological and economic challenges faced by peasants in these countries are well-documented (e.g. O’Brien and Leichenko 2000; Misselhorn 2005; Minten et al. 2007). Conventional farming practices are afflicted by free market pressure to produce more food for less income, resulting in poverty, the destruction of the environment, neglecting animal welfare and human social justice. A promising tool for small-holders in developing regions is the access to value added agro-food markets, particularly organic and fair trade products and more recently Geographical Indications (GIs) (Murdoch et al. 2000; Bacon 2005; Fan and Chan-Kang 2005; Muradian and Pelupessy 2005; Raynolds et al. 2007; Teuber 2010; Geiger-Oneto and Arnould 2011). Value added labels offer an alternative to the conventional free trade regime by challenging market competitiveness based solely on price (Raynolds 2000) and by better valorising local resources and internalising social and environmental costs of production (Raynolds 2000; van der Ploeg et al. 2000; van der Ploeg and Renting 2004). Apart from social and environmental production standards, these labels may alleviate poverty by bringing higher prices to producers (Muradian and Pelupessy 2005). They are assumed to better connect producers and consumers, providing information about the place of production, the people involved in production and the production methods employed (Marsden et al. 2000; van der Ploeg and Renting 2004; Raynolds et al. 2007; Teuber 2010; Bramley and Biénabe 2013). However, certifications (e.g. Fair Trade, Organic, Rain Forest Alliance) are strategies from the North that might limit the local scope of decision making, impose high transaction costs on growers and squeeze out small-holders not being able to comply with certification standards (Raynolds et al. 2007; Mutersbaugh 2008). Thus, certification might shift power relations along international supply chains in favour of international corporations, better educated and bigger producers in developing countries. Nevertheless, GIs – i.e. protected labels of origin – might be different, as local producers by themselves define their specific rules for using the label, in contrast to organic or fair trade standards. According to the Article 22.1 of the Trade Related Aspects of Intellectual Property Rights Agreement -TRIPS Agreement- GIs are defined as “indications which identify a good as originating in the territory of a Member, or a region or locality in that territory, where a given quality, reputation or other characteristic of the good is essentially attributable to its geographical origin”. GIs can be regarded as a “resistance against the standardising effects of ‘placeless’ food production systems” (Mancini 2013, 296). Therefore, they are aimed to avoid appropriation of geographical names by groups or users not linked to the area, since large companies might take control of reputation and erode the benefits of origin production systems (Barjolle et al. 1998; Giovannucci et al. 2010; Mancini 2013). In this way, GIs can be seen as a way for re-shaping relations between local and international supply chain actors, in which local producer groups might be in a position to re-gain control over their goods (Laschewski and Penker 2009; McBride 2010). And in fact, producers from developing countries have started to consider GIs as another alternative to access value added markets (Neilson 2007; Suh and MacPherson 2007; Grote 2009; McBride 2010; Teuber 2010; Bramley 2011; Bramley and Biénabe 2013). Until August 2014, seven developing countries (China, Colombia, India, Morocco, Sri Lanka, Thailand and Turkey) have applied for Protected Geographical Indications (PGIs) under EU Regulation 510/2006, followed by Reg. 1151/2012 (European Commission 2014). According to Barham (2003), GIs have not been fully studied as examples of common property rights. Only recent research on GIs has started to conceptualise GIs as intellectual property rights resulting from collective action (Defrancesco et al. 2012; Galtier et al. 2013; Mancini 2013; Skilton and Wu 2013; Zhao et al. 2014). Although, none of these studies has yet analysed a product originating from a developing country which has been successfully registered in the EU, first results hint at the importance of collective action of producers, knowledge on GI-processes and supportive national GI-legislation. We attempt to go further and scrutinise the collective property right of a PGI by considering the eight design principles for the management of common-pool resources defined by Elinor Ostrom and colleagues. We selected the case of Café de Colombia, whose quality reputation was protected by Colombian coffee growers as the first non-European food product granted a PGI in the European Union in September 2007 (European Commission 2014). We examine the PGI’s characteristics of a common-pool resource such as collectively designed rules, which prevent free-riding, control quality and (over)exploitation in order to capture the limited consumers’ willingness to pay extra for origin coffee. Our objective is to identify the dynamics of collective action and institutions (rules of the game) developed and used by coffee producers to register and implement Café de Colombia as a PGI. More specifically, this article’s aim is to understand the role and applicability of Ostrom’s eight design principles for the collective management of common-pool resources (Poteete et al. 2010) for the Café de Colombia PGI. Our guiding research questions are: i) to what extent can the design principles explain effective collective action for GI registration and implementation? and ii) can collective action for GIs re-shape relations between supply chain actors and support producers in gaining control over origin products? A case study-based institutional analysis (Poteete et al. 2010) was employed to gain detailed and context specific knowledge. Accordingly, a combination of tools for data collection (Table 1) was employed during the field work in the Colombian coffee regions, namely in the southern, central and northern parts of the country (Figure 1). The field work in Colombia took place from June, 15 through September 12, 2012. Interviews were transcribed with f4 software. Direct citations in this article are referenced with codes from Table 1. Data collection was followed by qualitative text analyses (Patton 2002). MAXQDA software served as a tool for establishing the categories of analysis derived from the eight design principles (deductive codes). Further conditions for common-pool resource management served as inductive codes. We triangulated the results from the document analysis, observations and interviews for enhancing the validity of the results (Yin 2009). Reflective loops, i.e. discussion of intermediary and final results with experts (e.g. international GI-scholars, coffee experts), further improved the soundness of results. Geographical names have been used as hallmarks of artisans associations (guilds) since the Middle Ages to attest the geographical area the product comes from and to avoid misuse; thus, producers invested considerable amounts of time and money to create those signs for consumers who were located far away from producers (Thevenod-Mottet and Marie-Vivien 2011). According to the authors, these guilds could have been the first to introduce common trade indications designating quality parameters which are collectively managed and defined by producers. The indications of origin have been widely used for the marketing of wine; however food producers of coffee, meat and beer have also implemented GIs as intellectual property rights (Gill 2009). GIs differ from the indication of source. GIs refer to one specific product definition, standard or quality coming from its place of origin, a tradition, characteristic or reputation which is related to the place of production or processing (Thevenod-Mottet and Marie-Vivien 2011). The distinction between indicating a source in general and a GI in particular, justifies the characterisation of GIs as intellectual property rights and therefore limits their open use by giving exclusive rights to the involved producers only (Thevenod-Mottet and Marie-Vivien 2011; Gangjee 2012). Unified worldwide legal systems for GIs do not exist (Giovannucci et al. 2009; Gangjee 2012). The protection outside the country of origin can be achieved through international open systems (e.g. TRIPS Agreement) and through specific systems for GI-registration comprising bilateral or plurilateral agreements (e.g. Giovannucci et al. 2009; Thevenod-Mottet and Marie-Vivien 2011). Countries can protect GIs as a form of intellectual property through the following categories (Giovannucci et al. 2009): i) GI-specific laws (e.g. EU GI-regulation) or sui generis law systems against unfair competition or consumer laws; ii) trademark systems (e.g. United States) or other legal or administrative means. Whereas trademarks are usually characterised by the “first in time – first in right” principle and the right to transfer and/or sell the right to anyone, wherever located (Giovannucci et al. 2009; International Trademark Association 2013), GIs are not tradable and are only accessible for producer groups located in the origin region (Barham, 2003; Babcock and Clemens 2004). Therefore, the EU instruments for GI-protection (Table 2) confer rights to all regional actors complying with the standards and require collective action by producers for the GI-registration and implementation. GIs can be conceptualised as common-pool resources which refer to natural or human systems that generate limited benefits (Ostrom et al. 1994) and show two basic characteristics (Ostrom 2000): i) exclusion of individuals from the use of the good through physical or legal instruments (only those producers which are located in the defined GI-area are responsible for the reputation of the GI-product and allowed to benefit from it) and ii) rivalry over the goods’ benefits (producers cannot over-produce and flood the market with GI-goods due to the limited number of consumers willing to pay a price premium for renowned and high-quality origin coffee). As other common-pool resources, GIs face the challenge to create physical or institutional measures to exclude non-authorised users and thus, to prevent free-riding (Ostrom 2000). In contrast to traditional common-pool resources, the GI-governance system has to accomplish both, the creation of the common-pool resource (intellectual property) and its management. In the case of GIs, collective action is observed when a group of producers unifies efforts, acquire specific obligations, hold exclusive rights and enjoy the benefits accrued due to reputation and goodwill associated to a GI-product (Reviron and Chappuis 2011). Not specifically for GIs, but for a number of other common goods, long-term viability of collective action was strongly questioned in theory. Olson (1965) argued that groups do not necessarily come together to obtain shared outcomes or benefits; depending on individual interests and group size, benefits might be accrued by the most influential individual or minorities. Later on, Hardin (1968) related the degradation of the environment to the collective use of scarce common resources. However, numerous empirical studies confirmed that collective action can be sustained over time (Ostrom 1990). Instead of asking if long-term collective action is possible or not, scholars started to pose the question: “how a group of principals who are in an interdependent situation can organise and govern themselves to obtain continuing joint benefits when all face temptations to free-ride, shirk, or otherwise act opportunistically?” (Ostrom 1990, 29). After studying manifold cases, collective action scholars established seven design principles and an eighth for larger and complex settings (Ostrom 1990). A design principle is a key condition that fosters functioning collective action and institutions for common-pool resources (Ostrom 1990). Although at the beginning Ostrom stated that these principles may be speculative, she and her colleagues presented patterns that held over a long period of time (Hess and Ostrom 2007; Ostrom 1990; Poteete et al. 2010). Table 3 illustrates how Ostrom’s design principles can be considered for analysing common PGI-property rights. Coffee is one of the main Colombian export goods and due to its historical and economical relevance part of the Colombian identity. The prompt registration process of the Café de Colombia PGI, from 2005 to 2007, was possible due to the long coffee tradition and the existing institutional framework of the federally organised coffee growers. The Federación Nacional de Cafeteros de Colombia (the Federación) was created in 1927. Today, the Federación is a large coffee association representing more than 500,000 coffee producers. Since 1932 quality standards have been developed and modified for the quality export coffees (D). The federated coffee system (see Figure 2) involves Coffee Grower Committees (State and Municipal Committees) which gather extension staff as well as regional and local representatives of federated coffee growers, coffee purchasing points usually organised under coffee cooperatives, quality control and logistics (Almacafé), inspection offices at harbours (Oficinas de Inspección/Almacafé), a product certification office (Cafecert), a research organisation (Cenicafé) and an educational/training facility (Fundación Manuel Mejía). The Federación has also established commercial relations with national and international roasters and brand owners. Despite the limited experience with GIs (e.g. on how to access legal services, scientific knowledge or financial resources), the Federación was able to demonstrate the terroir and the coffee characteristics following Colombian national and EU legislations. The national Denomination of Origin (DO) and the EU PGI for Café de Colombia were recognised under Colombian and EU legislation in 2005 and 2007 respectively. Ostrom’s eight design principles served to understand the institutional conditions and collective efforts for establishing the common property right. The first principle acknowledges the relevance of clear geographical and social boundaries. The physical delimitation establishes the geographical boundaries of the PGI, which cover areas of established altitudes within 20 coffee states and defines the quality standards (I-FNC, I-Ce). The geographical boundaries were demarcated based on previous work done by scientists from Cenicafé, specialised cuppers at Almacafé and the Federación-owned geo-referenced database of all coffee plantations known as the Coffee Information System. Since the 1980s, scientists have established a common coffee profile for Café de Colombia by identifying high-quality coffee properties and growing areas (linking quality and geographical area). Here, collective efforts were significant in terms of human, financial resources and logistics. Whereas it is clear that basically all coffee growers who meet the well-established quality standards associated with the environmental characteristics that define Café de Colombia could benefit from the PGI, the social boundaries for other supply chain actors are still ambiguous. Internationally acting roasters and brand owners were not involved in the PGI-registration process, although Colombian coffee growers produce mainly green coffee, and therefore depend on international roasters and brand owners to process and pack the coffee abroad (I-FNC). On the one hand, growers saw in GIs an opportunity to define the rules of the game themselves (whereas other standards are defined by international players); on the other hand, now it is a challenge to contact international roasters and brand owners and try to convince them to adopt already established rules for the PGI-use (I-FNC). Up to August 2014, a total of 230 brands belonging to 62 roasters have signed agreements framed by the Federación and have become authorised PGI-users (I-FNC). Since its foundation the Federación has looked for strategies “to differentiate Colombian coffee as a consumer’s worldwide reference” (I-FNC). The National Coffee Congress (the highest decision board of the federated coffee growers) mandated the Federación to start the GI-registration process in December 2004. After the successful protection of certification marks and trademarks, GIs were considered as an additional opportunity of protecting, differentiating and commercialising the reputation of Colombian coffee to: (i) “prevent Colombian coffee growers and marketers from unfair competition” and (ii) “act as a legally binding element for ensuring the origin to consumers” (D-FNC). Accordingly, the main benefits until the PGI-registration were (I-FNC): (1) specialised knowledge and experience acquired by involved actors regarding new scientific and legal tools and (2) better product specification and definition, as well as origin traceability to identify Café de Colombia and regional coffees by sensorial, chemical origin analysis and cup tasting. “The PGI-process became an opportunity to consolidate the definitions previously established for Café de Colombia and its regional origins” (I-FNC). The envisaged benefits after registration are (I-FNC): (1) an expected price premium to be transferred to coffee growers in the long-term, “by narrowing the supply from specific and recognised origins and protecting it from blending; price premium tends to increase as a result of this segmentation strategy which in turn, through the purchase guarantee policy applied by the Federación, can mean higher prices for coffee growers for parchment coffee at purchasing points” (I-FNC); (2) improved long-term relations/communication between coffee growers and industrial coffee processors, but also the hope that “the GI empowers the growers role among the value chain members” (I-FNC); (3) discouraging international free-riding, as “GIs provide a new defensive tool, especially as Colombia has implemented the scientific development of Near-Infrared Spectroscopy (NIRs) evaluation machines at every seaport in Colombia to verify the origin of exported coffee” (I-FNC, I-Ins); (4) fostering regional knowledge, self-confidence and identifying what might cause positive spill-over effects on rural development in the long-run (e.g. agro-tourism) (I-FNC). The latter is particularly relevant for regional coffees (Café de Nariño) that were subsequently protected in Colombia (I-FNC). These regional denominations are a remarkable achievement for coffee growers located in poor and remote mountain areas, characterised by small production structures and often affected by armed conflicts, as these happen to be the regions distinguished by the highest coffee qualities (I-FNC). The main costs for the GI-registration were borne by the Federación, Cenicafé and Committees’ staff, as the coffee growers delegated the GI-registration process to the federated coffee system: “years of effort on accessing legal GI-knowledge, national and international regulations, on funding, on elaborating protocols and GI-files, on registration procedures, on sample collection, on analysis and on the construction of huge data bases were needed” (I-FNC). The major costs dealt with the compilation of information for the GI-file, accessing GI-knowledge (e.g. hiring specialised attorneys) and the understanding of the national and international GI-regulations. No new quality standards were defined for the GIs; thus, there was no confrontation among growers regarding the GI (I-FNC, I-Coop). According to the Federación, the main costs after registrations are latent: (1) communicating with roasters about the GI and (2) training of coffee growers to translate the abstract concept of GIs into something meaningful to them. In 2012, randomly selected coffee growers interviewed did not yet know about the EU protected GIs but were already aware about the regional coffee denomination in Nariño and the interrelation between coffee qualities/prices, geographical origin, local production and harvesting (FG-CG). Expected price premium for PGI-labelled coffee can take some years to be actually perceived by growers since the amount of authorised users is still very low and even those who signed a users’ agreement do not necessarily communicate the origin to their customers (I-FNC). Most exports to Europe are already GI-compliant. Nevertheless, this does not mean that they reach consumers with a GI-label, as a high proportion of the coffee is blended with coffee from other origins and varieties (I-FNC). Until now, only a very small proportion of roasted and soluble coffee is 100% Colombian coffee carrying the GI-label. The Federación expects that efforts for GI-registration will be rewarded in monetary terms in the long-run due to changing consumer demand. The Federación hopes that their GI-rules will guarantee that benefits remain with growers and are not appropriated by roasters/brand owners. However, time has to pass by to see the combined price and volume effects of Café de Colombia and their impact on the value chain (I-FNC). Contrary to many EU GIs, where producer associations were created in the process of GI-registration, the Federación, as central collective organisation was already established long before the GI-registration (D-FNC). The collective choice mechanisms (Figure 2) of the federated coffee growers involve: 376 Municipal Committees in which coffee representatives are democratically elected every four years; 15 State Committees gathering the coffee states and their elected representatives; the General Management (at the Federación) overseeing all programs at national level including marketing, financial, extension services, technical research, quality control and planning functions; the National Coffee Committee gathering state coffee representatives and government officials; the National Coffee Congress composed by elected representatives from all coffee growing states and related stakeholders (I-FNC). After the successful PGI-registration, the Federación established the rules governing the PGI-use for roasters and brand owners (D): “these are the rules of the game for administering the PGI” (I-FNC). Authorised users were not previously involved in the GI-process (I-FNC). Monitoring involves two actor groups, namely coffee growers (with regard to quality and the contribution to the collective good of the Colombian coffee reputation) and industrial processors (in view of unauthorised use). According to the purchasing guarantee scheme, growers are able to sell all their (parchment) coffee and get a market price depending upon the quality provided (I-FNC, O-Coop). Almacafé controls the physical and sensorial coffee quality characteristics of all Colombian coffees prior to the export. Moreover, information system mechanisms support the origin and coffee traceability (I-FNC, D). Cafecert, acting as a third party certification body, is in charge of the assessment of every potential user and the monitoring of the GI-use. Inspection offices in Colombian harbours check the quality and origin of coffee before shipment, e.g. based on Near-Infrared Spectroscopy (I-FNC). Furthermore, random samples of internationally traded coffee and further samples sent by GI-users are analysed in quality labs. Coffee growers accept lower prices if inferior quality is provided (O-Coop). The system of differentiated coffee prices had already been established long before the GI-registration and thus is broadly accepted as long as the overall price level is not put too much under pressure by international market developments. According to the rules for PGI-users who commercialise roasted or soluble coffee, minor and serious infringements are differentiated. The Federación would send written communication to PGI-users informing them about minor infractions before they escalate (serious infringements). As ultimate legal sanction, the authorisation of use can be cancelled (D). Due to the short-term experience with authorised users, infractions of PGI-rules have not resulted in court cases to date (I-FNC). Conflict resolution mechanisms among the federated coffee growers have been established over many decades. The GI-process itself did not encounter conflicts or tensions, as the decision for undertaking the GI-project was approved by the National Coffee Congress and – at least so far – coffee growers were not confronted with changed quality standards or GI-price premium. Generally, main tensions deal with prices which reflect world market coffee price fluctuations due to the liberalisation of coffee markets in 1989 with the abolition of the International Coffee Agreement. If national interventions (subsidies, commercialisation strategies) are not able to cope with the long-term depression of international coffee prices, coffee growers – like in 2013 – will start protests against the coffee institutions and the government. One requirement for the PGI-registration in the EU is having first a national registration in the origin country. The Federación elaborated the rules governing both the national Denomination of Origin (DO) and the Café de Colombia PGI that were both approved by the Superintendence of Industry and Commerce in 2005 and 2010 respectively (D). This government entity also formally recognised the management of the PGI by the Federación in 2010. The collective rights of Colombian growers are recognised with every GI-registration such as in Colombia, the EU or Switzerland. Changes at international stances, but also on national or supra-national level can alter the GI-implementation. As of article 12 of the EU regulation 1151/2012, the Union symbol designed to publicise PGIs shall appear on EU products while it is optional for third-country goods. Therefore, even authorised users might not necessarily use the label. 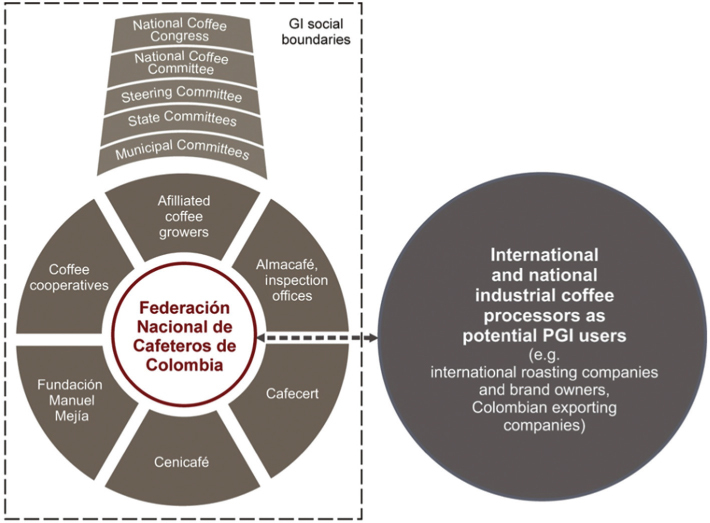 Numerous organisations (Figure 2) constituting the Colombian federated coffee system (as described above) were involved in the registration and implementation of the PGI. Under the umbrella of the Federación, quality coffee is collected (coffee cooperatives), quality is controlled (Almacafé, Cafecert, Inspection Offices) and improved by research (Cenicafé) and extension services (Committees). Outside the federated system commercial relationships with industrial processors are needed for the commercialisation of the Café de Colombia PGI. Besides the eight design principles, we identified two additional cross-cutting issues for successful GI-registration: trust and awareness building. Coffee elections allow growers to designate representatives who bring their concerns to the attention of the committees and the National Coffee Congress (D, I-FNC, I-CG). When coffee growers sell their coffee to the cooperatives, they are conscious that market prices are established based on quality standards already known and accepted (I-CG, O). Since the creation of the Federación, the majority of coffee growers trust the nested coffee organisations; however, coffee price developments and other internal issues put some pressure on the system. In contrast to the established trust among federated coffee growers, relationships along the international supply chain are characterised by weak vertical integration. Hence, the Federación is convinced that there is need for formal agreements with industrial processors and diverse types of monitoring to protect Colombian coffee abroad. The interviewed experts consider the EU PGI as a learning experience for understanding the link between quality and the local context of production, which resulted in the subsequent national protection of regional GIs (Café de Nariño, Café de Cauca). There is confidence that these regional GIs may provide further incentives for quality production, local roasting of regional coffee, local identity and rural development and might attract international/national tourists to certain coffee areas. In Nariño, the Chamber of Commerce strongly promotes local awareness on processing and consumption of regional high-quality coffee (I-Ex).While most international consumers are not aware of regional high-quality coffees coming from Nariño or Cauca (which was one of the reasons for registering Café de Colombia in the EU), large roasters already recognise the coffee quality of these regions (I-Ro). Along international supply chains, awareness building, however, remains a major challenge. It will need more consumers appreciating high-quality origin coffee and more roasters putting emphasis on GI-coffee in addition to their brands of blended coffee. We consider the Colombian PGI as a unique case from a developing country due to the well-established institutions, its protected certification and trademarks or the quality standards founded long before the PGI-registration (Reina et al. 2007; Hughes 2009). The robust multi-level and multi-actor governance framework endorsed collective efforts for the effective GI-registration. In a contrasting case, in the Jarabacoa region, Dominican Republic, through coffee growers and stakeholders intended to build up a regional coffee GI, diverse types of actors and interests – not gathered under the same umbrella – and lack of trust and differences in production standards hindered the national registration (Galtier et al. 2013). The Ethiopian Government has not considered to apply for the GI-system in the EU (Roussel and Verdeaux 2007; Hughes 2009), instead “has filled trademark applications in over 30 countries including the United States and the EU for Harrar, Sidamo and Yirgacheffe (coffee-growing regions)” (Teuber 2010, 280). This case presents a lack of visibility of farmers and their collective action experiences. The nationally registered Indonesian GI-coffee (Bali Kintamani) involved the government, external supporters as well as all supply chain actors during the GI-process (Vu and Dao 2006); nonetheless it did not apply for a registration in the EU. Currently, there are two Thai PGIs (Kafae Doi Chaang and Kafae Doi Tung) and one Dominican Republic PDO (Café de Valdesia) for coffee in process of registration (European Commission, 2014), thus Café de Colombia is still the first and only coffee GI registered in the EU. Developing countries should guard their intellectual property assets using adequate tools such as GIs to allow them to access new markets and make their own businesses feasible (Mengistie 2012). From this perspective, GIs have an advantage over trademarks, as they can neither be sold to powerful corporations nor be delocalised (Babcock and Clemens 2004). Café de Colombia is certainly a collective right obtained and managed by federated growers. Nevertheless, international roasters and brand owners are needed because growers are not vertically integrated. With the PGI-registration, producers had the possibility to define the rules for authorised users. Thus, GIs might not only be a way to capture the value of geographical origin (Daviron and Ponte 2005), but also to support a fair distribution of benefits along a supply chain characterised by a large number of small producers and a reduced number of industrial processors. Thus, the involvement of international roasters as crucial gatekeepers (Wongprawmas et al. 2012) has to be timed and prepared cautiously. A recent study carried out by Areté (2013) on behalf of the EU showed that 10 from the 13 GI-products analysed obtained a price premium compared to the corresponding standard good. However, the price difference was less clear for farmers who supply agricultural raw materials (only in 5 from 13 GI-cases analysed they obtained higher prices compared to standard products). The registered origin products gained other value added characteristics such as: “protection of intellectual property rights, improved visibility, better access to new markets, better access to promotion funds and investment aid, better support under rural development” (Areté 2013, 11). An additional price premium due to the registration of the Café de Colombia PGI is still to be appreciated. The design principles for managing common-pool resources have been widely used for assessing the governance of local commons involving natural resources. Hence, the transferability of the principles for assessing common-pool resources involving external markets or socio-economic factors is challenging (Cox et al. 2010). In our case, the principles are very helpful to understand the internal collective action of more than 500,000 coffee growers (Table 4); however they show challenges in the interaction with international roasters and brand owners (e.g. no collective choice arrangements, no conflict resolution mechanisms, no clear boundaries). This analysis also highlights that a pure focus on the producers’ collective action for establishing and managing origin protection would not provide a complete picture. This goes in line with scholars cautioning that the application of the design principles could draw the attention to external factors (Agrawal 2002; Cox et al. 2010). Other important conditions which could complete the picture of collective action for origin protection deal with the level of trust and awareness building. While internal trust among producers within the federated system is established, creating trust along the supply chain is more challenging as stakeholders are diverse and have different geographical scopes, interests and power relations. Transcontinental supply chains differ from the ones of traditional EU GIs, where the whole value chain is often located within Europe. An indirect benefit of the GI-process is the specialised knowledge of regional coffees and the establishment of regional GIs, but it is still to see if GI-knowledge can also be communicated to European consumers. Café de Colombia is a producer-led effort without direct influence of international roasters, donors or government authorities. Therefore, the design principles are very helpful for explaining producers’ collective action for protecting the reputation of Café de Colombia in the EU. The principles illustrate the relevance of self-organisation, robust and context-sensitive institutions, clear geographical and social boundaries and supportive national GI-legislations as pre-conditions for the GI-registration. Despite coffee growers’ focus on self-organisation and collective action, we must not forget the gatekeepers’ role of international supply chain actors who can prevent consumers from learning about the coffee origin. Colombia exports green coffee which explains the dependence on roasters or brand owners who normally blend Colombian coffee with other origins. Additionally, according to the EU GI-legislation, these are not obliged to add the GI-symbol on the package of third-country GI-products. Thus, it will be up to the consumer demand and the willingness of international roasters and brand owners to communicate origin coffee. GIs, in contrast to other labels (e.g. Fair Trade, Organic certification) allow producers from developing countries to define their own rules for using the label, their own quality standards and their own social boundaries. The GI has already re-shaped relationships along the supply chains, as international roasters and brand owners sign the producers’ rules governing the PGI-use. The commercial GI-impact, however, will depend on consumers’ willingness to appreciate and pay extra for high-quality origin coffee as well as the readiness of roasters and brand owners to emphasise on origin coffee, in addition to their brands of blended coffee. Therefore, the Federación tries to control the allocation of a possible GI-related price premium along the supply chain in favour of Colombian coffee producers. As Colombia is the first developing country who registered a GI in Europe and other countries from the South followed only recently, it is still early to draw general conclusions on a re-shaping of (power) relationships along international supply chains. We truly thank the Federación Nacional de Cafeteros de Colombia in Bogotá; the coffee cooperatives in Pasto, La Unión, Santa Marta and Andes; the coffee committees in Pasto, La Unión, Buesaco, Sandoná, Santa Marta and Valledupar; the coffee inspection offices in Buenaventura and Santa Marta; all interviewed coffee growers in the municipalities above mentioned and in Pueblobello, Yerwura, La Marina (Tuluá), Riofrío, Ciudad Bolívar and Concordia; the coffee experts Carlos A. García, Julián García, Jorge H. Botero, Carlos A. Escobar, and Víctor Cordero as well as Andrés M. Villegas from Cenicafé for the guidance provided during the field work. We are grateful for the valuable inputs and feedback provided by Giovanni Belletti and Juergen Simon as well as for the copy editing done by Christina Roder. We kindly acknowledge the funding provided by the Austrian National Bank (OeNB) for conducting this research. Agrawal, A , ; Common Resources and Institutional Sustainability. In: Ostrom, E, Dietz, T, Dolsak, N, Stern, P. C, Stonich, S and Weber, E. U eds. , editors. The Drama of the Commons. Washington: DC: National Academy Press, 2002. p. 41.-86. Aubard, A , ; Setting up a GI. In: Blakeney, M, Coulet, T, Mengistie, G and Mahop, M. T eds. , editors. Extending the Protection of Geographical Indication. Abingdon: Earthscan, 2012. p. 35.-50. Babcock, B. A and Clemens, R , . Geographical Indications and Property Rights: Protecting Value-Added Agricultural Products. Midwest Agribusiness Trade Research and Information Center (MATRIC) Publications 04-mbp7. Midwest Agribusiness Trade Research and Information Center (MATRIC): Iowa State University. 2004. Bacon, C (2005). Confronting the Coffee Crisis: Can Fair Trade, Organic, and Specialty Coffees Reduce Small-Scale Farmer Vulnerability in Northern Nicaragua?. World Development 33(3): 497–511. Barham, E (2003). Translating Terroir: The Global Challenge of French AOC Labeling. Journal of Rural Studies 19(1): 127–138. Barham, E and Sylvander, B , . Labels of Origin for Food: Local Development, Global Recognition. Wallingford: Cabi. 2011. Barjolle, D, Chappuis, J. M and Sylvander, B , . In Proceeding of the 59th EAAE Seminar Does economic theory contribute to a better understanding of competitiveness?. Appeldoorn: The Netherlands. 1998 Apr 22–24. From Individual Competitiveness to Collective Effectiveness: A Study on Cheese with Protected Designations of Origin. Bramley, C , . In WIPO Worldwide Symposium on Geographical Indications. Lima: Peru. 2011 Jun 22–24. A Review of the Socio-Economic Impact of Geographical Indications: Considerations for the Developing World..
Bramley, C and Biénabe, E , ; Why the Need to Consider GIs in the South?. In: Bramley, C, Bienabe, E and Kirsten, J eds. , editors. In Developing Geographical Indications in the South. Dordrecht: Springer, 2013. p. 1.-14. Coulet, T , ; Assessing the Economic Impact of GI Protection. In: Blakeney, M, Coulet, T, Mengistie, G and Mahop, M. T eds. , editors. In Extending the Protection of Geographical Indications. Abingdon: Earthscan, 2012. p. 101.-119. Cox, M, Arnold, G and Villamayor-Tomas, S (2010). A Review of Design Principles for Community-Based Natural Resource Management. Ecology and Society 15(4): 38. Daviron, B and Ponte, S , . The Coffee Paradox: Global Markets, Commodity Trade, and the Elusive Promise of Development. London and New York: Zed Books. 2005. Defrancesco, E, Estrella Orrego, J and Gennari, A (2012). Would ‘New World’ Wines Benefit from Protected Geographical Indications in International Markets? The Case of Argentinean Malbec. Wine Economics and Policy 1(1): 63–72. Fan, S and Chan-Kang, C (2005). Is Small Beautiful? Farm Size, Productivity, and Poverty in Asian Agriculture. Agricultural Economics 32(1): 135–146. Galtier, F, Belletti, G and Marescotti, A (2013). Factors Constraining Building Effective and Fair Geographical Indications for Coffee: Insights from a Dominican Case Study.. Development Policy Review 31(5): 597–615. Gangjee, D , . Relocating the Law of Geographical Indications. Cambridge, UK: Cambridge University Press. 2012. Geiger-Oneto, S and Arnould, E. J (2011). Alternative Trade Organization and Subjective Quality of Life The Case of Latin American Coffee Producers. Journal of Macromarketing 31(3): 276–290. Gill, B (2009). Property Claims in Genetically and Non-Genetically Modified Crops: Intellectual Property Rights vs. Brand Property Rights in Postindustrial Knowledge Societies. Journal of Agricultural Resources, Governance and Ecology 8: 14–36. Giovannucci, D, Barham, E and Pirog, R (2010). Defining and Marketing ‘Local’ Foods: Geographical Indications for US Products. The Journal of World Intellectual Property 13(2): 94–120. Giovannucci, D, Josling, T, Kerr, W, O’Connor, B and Yeung, M. Y , . Guide to Geographical Indications. Linking Products and Their Regions.. Geneva, Switzerland: International Trade Centre. 2009. Grote, U (2009). Environmental Labeling, Protected Geographical Indications and the Interests of Developing Countries. Centre Journal of International Law and Trade Policy 10(1): 94–110. Hess, C and Ostrom, E , ; A Framework for Analyzing the Knowledge Commons. In: Hess, C and Ostrom, E eds. , editors. Understanding Knowledge as a Commons: From Theory to Practice. Cambridge, Mass: MIT Press, 2007. p. 41.-82. Laschewski, L and Penker, M (2009). Rural Change and Revalorisation of Rural Property Objects. International Journal of Agricultural Resources, Governance and Ecology 8(1): 1–13. Mancini, M. C (2013). Geographical Indications in Latin America Value Chains: A ‘branding from Below’ Strategy or a Mechanism Excluding the Poorest?. Journal of Rural Studies 32: 295–306. Marsden, T, Banks, J and Bristow, G (2000). Food Supply Chain Approaches: Exploring Their Role in Rural Development. Sociologia Ruralis 40: 424–438. McBride, W (2010). GI Joe? Coffee, Location, and Regulatory Accountability. New York University Law Review 85(6): 2138–2168. Mengistie, G , ; Ethiopia: Fine Coffee. In: Blakeney, M, Coulet, T, Mengistie, G and Mahop, M. T eds. , editors. In Extending the Protection of Geographical Indication. Abingdon: Earthscan, 2012. p. 150.-174. Minten, B, Randrianarison, L and Swinnen, J (2007). Spillovers from High-Value Agriculture for Exports on Land Use in Developing Countries: Evidence from Madagascar. Agricultural Economics 37(2–3): 265–275. Misselhorn, A. A (2005). What Drives Food Insecurity in Southern Africa? A Meta-Analysis of Household Economy Studies. Global Environmental Change 15(1): 33–43. Muradian, R and Pelupessy, W (2005). Governing the Coffee Chain: The Role of Voluntary Regulatory Systems. World Development 33(12): 2029–2044. Murdoch, J, Marsden, T and Banks, J (2000). Quality, Nature, and Embeddedness: Some Theoretical Considerations in the Context of the Food Sector. Economic Geography 76(2): 107–125. Mutersbaugh, T , ; Serve and Certify: Paradoxes of Service Work in Organic Coffee Certification. In: Bacon, C. M, Mendez, V. E, Gliessman, S. R, Goodman, D and Fox, J. A eds. , editors. In Confronting the Coffee Crisis. Cambridge: MA: The MIT Press, 2008. p. 261.-288. Neilson, J (2007). Institutions, the Governance of Quality and on-Farm Value Retention for Indonesian Specialty Coffee. Singapore Journal of Tropical Geography 28(2): 188–204. O’Brien, K. L and Leichenko, R. M (2000). Double Exposure: Assessing the Impacts of Climate Change within the Context of Economic Globalization. Global Environmental Change 10(3): 221–232. Olson, M , . The Logic of Collective Action: Public Goods and the Theory of Groups. Cambridge, MA: Harvard University Press. 1965. Ostrom, E , . Governing the Commons: The Evolution of Institutions for Collective Action. Cambridge, MA: Cambridge University Press. 1990. Ostrom, E , ; Private and Common Property Rights. In: Bouckaert, B and De Geest, G eds. , editors. In Encyclopedia of Law and Economics: Civil Law and Economics. II. Cheltenham, England: Edward Elgar Pub, 2000. p. 332.-379. Ostrom, E, Gardner, R and Walker, J , . Rules, Games, and Common-Pool Resources. Michigan: University of Michigan Press. 1994. Patton, M. Q , . Qualitative Research and Evaluation Methods. 3rd ed.. London: Sage Publications. 2002. Poteete, A. R, Janssen, M. A and Ostrom, E , . Working Together: Collective Action, the Commons, and Multiple Methods in Practice. Princeton: Princeton University Press. 2010. Raynolds, L. T (2000). Re-Embedding Global Agriculture: The International Organic and Fair Trade Movements. Agriculture and Human Values 17(3): 297–309. Raynolds, L. T, Murray, D and Heller, A (2007). Regulating Sustainability in the Coffee Sector: A Comparative Analysis of Third-Party Environmental and Social Certification Initiatives. Agriculture and Human Values 24(2): 147–163. Reina, M, Silva, G, Samper, L. F and Fernández, M. P , . La Estrategia Detrás de La Marca. 1st ed.. Bogota: Ediciones B Colombia S.A. 2007. Reviron, S and Chappuis, J. M , ; Geographical Indications: Collective Organization and Management. In: Barham, E and Sylvander, B eds. , editors. Labels of Origin for Food: Local Development, Global Recognition. Wallingford: Cabi, 2011. p. 45.-62. Roussel, B and Verdeaux, F (2007). Natural Patrimony and Local Communities in Ethiopia: Advantages and Limitations of a System of Geographical Indications. Africa 77(01): 130–150. Skilton, P. L and Wu, Z (2013). Governance Regimes for Protected Geographic Indicators: Impacts on Food Marketing Systems. Journal of Macromarketing 33(2): 144–159. Suh, J and MacPherson, A (2007). The Impact of Geographical Indication on the Revitalisation of a Regional Economy: A Case Study of ‘Boseong’ Green Tea. Area 39(4): 518–527. Teuber, R (2010). 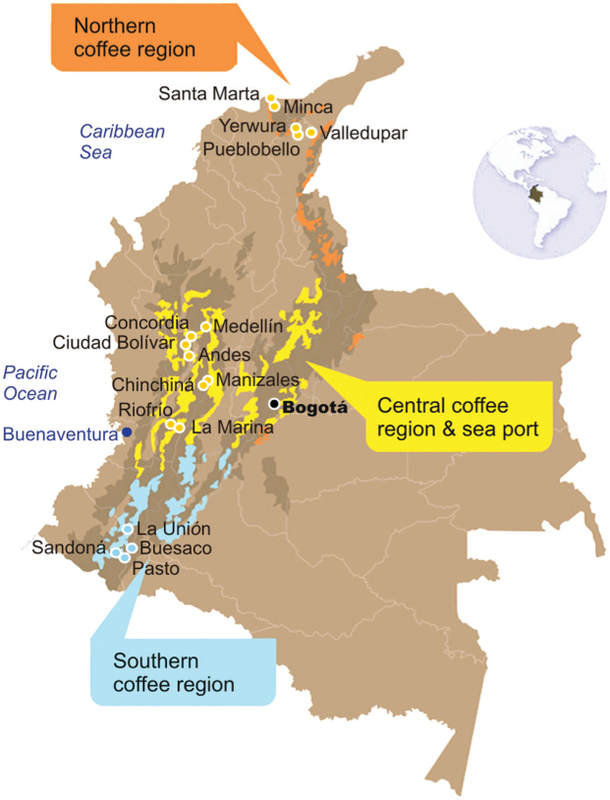 Geographical Indications of Origin as a Tool of Product Differentiation: The Case of Coffee. Journal of International Food & Agribusiness Marketing 22(3–4): 277–298. Thevenod-Mottet, E and Marie-Vivien, D , ; Legal Debates Surrounding Geographical Indications. In: Barham, E and Sylvander, B eds. , editors. Labels of Origin for Food: Local Development, Global Recognition. Wallingford: Cabi, 2011. p. 13.-28.
van der Ploeg, J. D and Renting, H (2004). Behind the ‘Redux’: A Rejoinder to David Goodman. Sociologia Ruralis 44(2): 234–242. van der Ploeg, J. D, Renting, H, Brunori, G, Knickel, K, Mannion, J, Marsden, T, De Roest, K, Sevilla-Guzmán, E and Ventura, F (2000). Rural Development: From Practices and Policies towards Theory. Sociologia Ruralis 40(4): 391–408. Wongprawmas, R, Canavari, M, Haas, R and Asioli, D (2012). Gatekeepers’ Perceptions of Thai Geographical Indication Products in Europe. Journal of International Food & Agribusiness Marketing 24(3): 185–200. Yin, R. K , . Case Study Research: Design and Methods. 4th ed. Vol. 5. Applied Social Research Methods. Los Angeles: Sage Publications. 2009. Zhao, X, Finlay, D and Kneafsey, M (2014). The Effectiveness of Contemporary Geographical Indications (GIs) Schemes in Enhancing the Quality of Chinese Agrifoods – Experiences from the Field. Journal of Rural Studies 36: 77–86. Map of Colombian coffee regions. Source: Adapted from Federación Nacional de Cafeteros. Multi-actor nested organisation for GI-governance.